Women in the 16th/17th century at the time of the witch craze were very different from the average 21st century woman. 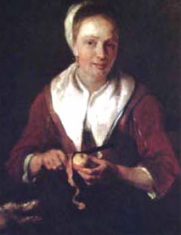 At that time, women’s main job was to cook and manage the household, a typical housewife. Women had very little opportunity for education or work, of the very little that did work, many were domestic servants. Women had very little if no rights at all, they had no right to vote or even to choose their own partner, from birth they were the property of their father and then their husbands after marriage. Life for the 16th century woman was not one of the greatest. Knowing the general facts of a woman's life at the time we can decipher why many witches that were hung were women. Women were seen as weak and had no rights at all therefore the finger of blame always pointed towards them. As time progresses though, the rights of women began to improve; it took a few centuries but at least we finally got somewhere. A group of women known as the Suffragettes, protested for the right to vote hence their name, their efforts paid off in 1918 when women got the right to vote. After that there was no stopping women, they were filling nearly all job vacancies, achieving top grades in schools and in 1979 UK got their first female prime minister. In the present day, women are considered as equals to men, yet there are some underlying truths that dent this theory, such as the fact that in some jobs, women are paid less that men solely based on their gender. This shows that women have changed significantly since the time of the witch craze but there is still a long way to go until we achieve a total sense of equilibrium. Below is the picture of a woman working on an aeroplane motor, depicting the fact that we are overcoming stereotypical barriers.